Available at SGS Engineering are Milwaukee torches which are available as 18V or 12V. The Milwaukee model M18TLED-0 LED torch is powered with an REDLITHIUM™ battery which can run 4x longer on one charge and is an ideal alternative to incandescent bulbs with the light lasting 600x longer. You can direct the light beam of the torch with ease with the 135° rotating head which is sealed aluminium to prevent weather and impact damage.Also available is the Milwaukee M12TLED-0 LED Torch is an ideal alternative to incandescent lights as the torch is 2x brighter and whiter. The torch is ideal for accurately lighting up the area you need with the 90 degree rotating head. Both torches are available as single items (without battery/charger) or as a bundle that includes a battery and charger. As any top tradesman knows, good visibility is essential when carrying out any kind of work. Milwaukee torches are the best way to illuminate any darkened area, whether you are working at night or in a confined space with little light. Every home needs a good torch just in case. The Milwaukee 18v torch is a handy item to have around and will come in useful frequently. If you are looking for a reliable torch that can be used hands-free, the Milwaukee M18 LED torch has a 135° rotating head and provides 1250 lumens with a beam distance of up to 650 m. The Milwaukee M18 LED torch has four output modes, so it can be used in a variety of settings, plus it is aluminium sealed to protect it from the elements and impact damage. The Milwaukee M12 torch, meanwhile, is a terrific alternative to incandescent lights as the torch is 2x brighter and white. 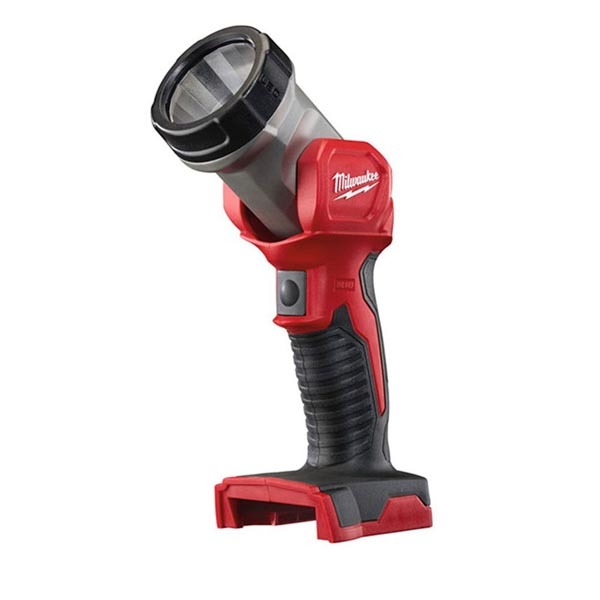 For illuminating large outdoor spaces, the Milwaukee 18v torch has 4,400 lumens and can be turned down to 1,000 for smaller spaces. The M18ONERSAL-0 remote area light can be used in any weather and has 0-5,400 lumens, whilst the M18AL-0 Milwaukee 18v LED torch uses 8 high-performance LEDs providing 1,100 lumens and it can be used at multiple angles. Milwaukee torches are the best in the business whether you are looking for a heavy duty torch to use on the worksite at night, or a simple handheld torch to illuminate a confined space.